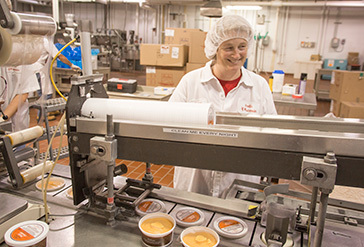 Scott's of Wisconsin was started more than 30 years ago with a personal passion and commitment to create the highest quality and best tasting cheese products. The company founder knew that the words "of Wisconsin" would have to mean more, because customers would expect "More to Love" from a cheese that's Made-in-Wisconsin. More starts with milk from family dairy farms; more is added with the finest ingredients; more expertise comes from experienced and caring employees; and, more passion for quality is our commitment. Today, Scott's of Wisconsin is owned and operated by the Knaus Family, a family with more than a century of experience in the cheese industry. Scott's of Wisconsin has become the Knaus Family legacy and we are dedicated to continuing this concept of giving more to our customers. When you buy Scott's of Wisconsin cheeses and dairy products you can taste the difference. Scott's takes pride in creating the highest quality cheeses and dairy products, from farm-to-fridge and from their family to yours. With the Knaus Family and more than 100 years experience, that's one more reason why there's More to Love at Scott's of Wisconsin.